The Vale of Illyria, now a blasted ruin on the face of Ghur, was once the heartland of a vast and thriving civilization, ruling for a thousand years with honor and justice over many peoples and many cities scattered across three Mortal Realms. Its strength and prosperity came from its laws, its liberty, and the unmatched steel of its legions. Drawn from the citizenry itself, these swore unending faithfulness to Illyria's glorious Consuls, its Senate, and its people. During the last war against Chaos, though, Illyria was sore pressed, as its provinces fell into ruin and its great works were torn down until only the Vale itself remained unconquered. Here the last of the great Legions, the Ninth, made its stand under the command of their general Horatio Paulus. He defended the Eagle Pass, the only route that an army of any size could take through the forbidding mountains. For three long months Paulus and his troops held off countless sorties by the armies of the Dark Gods in one brilliant tactical victory after another, forming an unbreachable bulwark against their advances. When they fell it was not to spears or arrows but basest treachery. A cult to the Dark Gods had long festered unseen in the depths of Illyria, and now it rose, setting brother against sister, Senator against Senator, Consul against Consul. In the confusion, someone poisoned the Ninth Legion's supply trains. In a night, the Legion fell victim to Nurglish rot. Only Paulus, the Valorous, who had been warned in a dream, was able to escape the fast-spreading contagion. There is a place where the Eagle Pass reaches its highest, where the walls of the pass grow so thin that only one or two men can walk abreast. Here Paulus made his stand, swearing to die in defense of his people and his beliefs. As the sun rose higher in the sky, he slew first the raised corpses of his comrades, then the foot soldiers of the Enemy, then rank upon rank of demons, standing atop a growing pile of bodies. Finally the great demon Kalathraxx came forth. He praised Paulus' bravery and his skill at arms, offering him an eternity in Khorne's legions if he would but bend the knee. Paulus only laughed. It was better to die as a citizen of Illyria than live a thousand years as a slave to the Dark Gods, he said, and challenged Kalathraxx to come forwards and know the measure of a true soldier and a true Citizen. The demon struck, blindingly fast and unthinkably strong, and Paulus was mortally wounded- yet even as he died he gouged Kalathraxx's left eye from its socket. Thus did the last Centurion of Illyria die, in defense of a city and a people already all but destroyed. For his devotion to duty and his faith in his cause Sigmar took his soul and reforged him into a shining exemplar of his will. He was bestowed upon Steelios and the Death Watch, for Sigmar knew that while the Lord Castellant had wrath and righteousness in equal measure the purest alloy was made when these were tempered by duty and valor. From above, he rains death and destruction on the enemies of the God-King, and brings hope to the oppressed who find themselves beneath the shadow of his mighty wings. 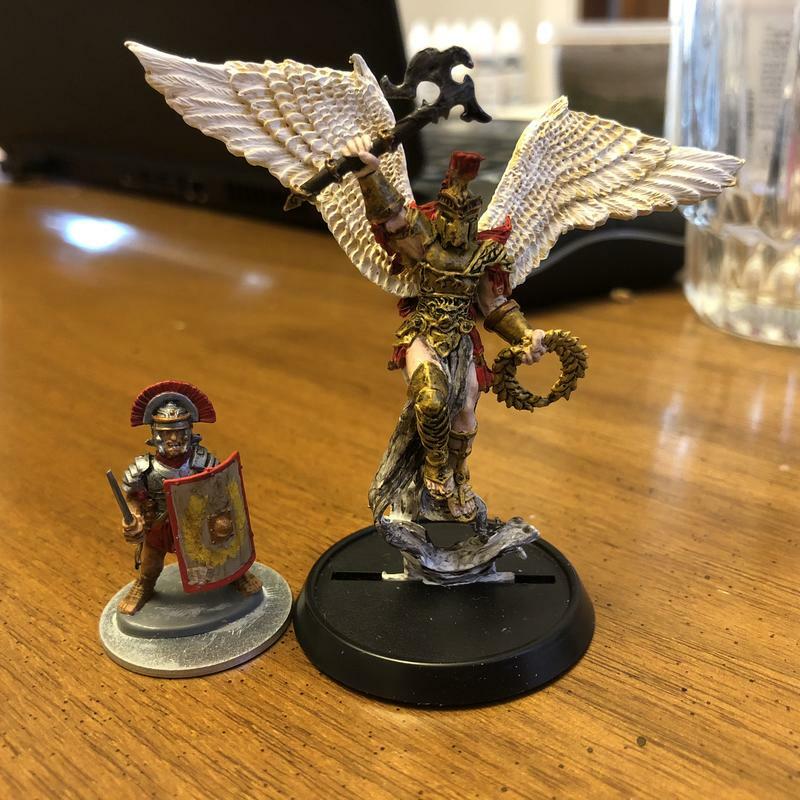 The storytellers call Brother Paulus the Victor, the Centurion, the Elder Soldier, the Avenger, the Eagle of Illyria, Sigmar's Lightning, the Angel of Blood, the Faithful Servant, the Prosecutor of Justice, the Falling Star, the Fourth, the Valorous, the Dutiful Warrior, the Marauder’s Bane, the Rewarded.